Maurice Barret-Décap, Paris and Biarritz, from ca. 1887. (Durand-Ruel, New York); sold 1927 to Chester Dale [1883-1962], New York; bequest 1963 to NGA. According to Chester Dale papers in NGA curatorial files, the painting had been in the Barret-Décap collection for forty years. Exhibition Paintings by Armand Guillaumin, Durand-Ruel Galleries, New York, 1928, no. 2. Manet and Modern Paris, National Gallery of Art, Washington, D.C., 1982-1983, no. 8, repro. Dale, Maud. Before Manet to Modigliani from the Chester Dale Collection. New York, 1929: no. 45, repro. Collection des Maitres. Vol. III. Peinture Française, XIXe Siècle. Paris, 1934: pl. 37. French Paintings from the Chester Dale Collection. National Gallery of Art, Washington, 1942: 72, repro. French Paintings from the Chester Dale Collection. 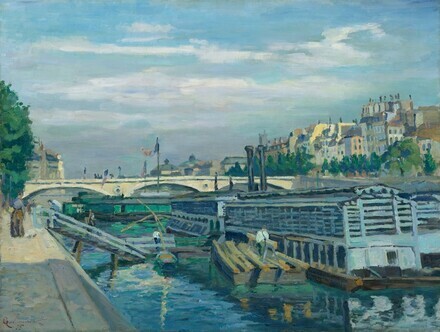 National Gallery of Art, Washington, 1944: 72, repro. French Paintings from the Chester Dale Collection. National Gallery of Art, Washington, 1953: 65, repro. Eighteenth and Nineteenth Century Paintings & Sculpture of the French School in the Chester Dale Collection, National Gallery of Art, Washington, 1965: 100, repro. Summary Catalogue of European Paintings and Sculpture. National Gallery of Art, Washington, 1965: 65. European Paintings and Sculpture, Illustrations. National Gallery of Art, Washington, 1968: 57, repro. Serret, G., and D. Fabiani. Armand Guillaumin, 1841-1927. Catalogue raisonné de l'oeuvre peint. Paris, 1971, no. 44. European Paintings: An Illustrated Summary Catalogue. National Gallery of Art, Washington, 1975: 168, repro. Rewald, John. The History of Impressionism. New York, 1976: repro. European Paintings: An Illustrated Catalogue. National Gallery of Art, Washington, 1985: 195, repro. "Guillaumin, (Jean-Baptiste-) Armand." Britannica, 15th ed., 1991: 552, repro. Lurie, Patty. Guide to Impressionist Paris. Manchester, New Hampshire, 1996: 48-49, repro. Gaussen, Frederic. Le 4e Arrondissement vu par les peintres. Paris, 1998: 94-95, repro. 95.